This basic CPR training session is intended for community members and/or employees who may need or feel compelled to respond to an emergency. This program is intended to convey and demonstrate the recommended lifesaving care that may be necessary at the scene of an emergency. The risk factors for a heart attack and/or stroke. Information about normal heart and lung function. How to recognize a life-threatening emergency. When and how to properly activate the emergency medical services (EMS) system. How to make a difference in the outcome of emergencies. How to provide basic life support (BLS). What to do in the case of an airway obstruction (choking). How to provide care for a life-threatening bleeding emergency. How to provide basic care for someone who may be in shock. And more, sign up today! 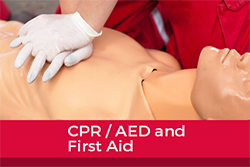 ASHI CPR CERTIFICATION IS VALID FOR TWO (2) YEARS. First Aid is the immediate care given to the injured or suddenly ill person. It is the temporary assistance that is rendered until competent medical care, if required, arrives and takes over. This is a basic program that will concentrate on the first five minutes of care. If your work or lifestyle places you in locations where the EMS (Emergency Medical System) response time is questionable, we recommend that you participate in a first responder program. Properly applied first aid can save lives, reduce recovery time, and quite possibly be the difference between temporary disability or lifelong disability for the victim. ASHI FIRST AID CERTIFICATION IS VALID FOR TWO (2) YEARS.